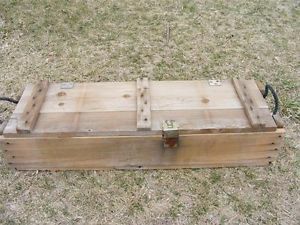 Howitzer Ammo Box--what species of wood is this? Pine? It’s light, fairly soft…and smells like the Army: mothballs, mold, dirt and oil. The wood boxes are not made anymore, I believe. This thing came from the Vietnam War Era. At least, in Southern California, the things are getting hard to find. I’m going to use this to store some wood planes when I get done with it. I just want to know what it’s made of. I now believe it’s poplar. This box held two rounds of something—105mm artillery or tank rounds? Also, I guess it’s Iraq War Era as I found a stamp dated 1997. They won’t last very long. There is no relief for wood movement. With everything nailed something will give, probably later than sooner though.